The Irish National Stud are delighted to announce that National Defense Champion 2YO National has sired his first foal. The filly born just before midnight last night was foaled by I.N.S Graduate Olive O’ Connor was on behalf of a French syndicate. The bay filly is the first for Teofilo Mare Gaita. She is a half-sister to Blacktype Hyper Hyper from the family of Champion Female Miler Giofra. Olive described the filly as being smart, attractive and nicely made. The son of Invincible Spirit bred by Ecurie des Monceaux and Meridian International was purchased at Arqana yearling sales for €280,000 by Sun Kingdom who raced the colt and have supported him with a fantastic book of mares which included 50% Blacktype producers / performers. 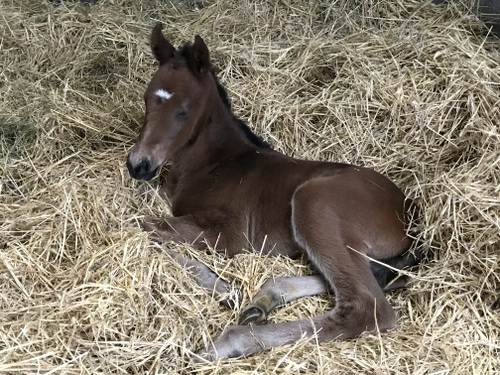 I.N.S CEO Cathal Beale commented ‘ National Defense is Invincible Spirit’s highest rated 2YO, we are delighted to see his first foals being born. Hopefully he can follow in the footsteps of Kingman, Charm Spirit and I Am Invincible’. National Defense stands for €8,000.